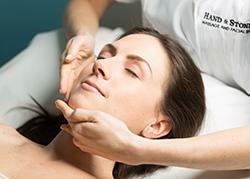 Banish the dull skin and give your confidence a boost by getting a facial. Here in Olney, MD, you can turn to Hand & Stone for assistance with acne, rosacea, and other concerns. We have experienced professionals waiting to serve you, and we use premium skin care products for more impressive results. Make an appointment for your facial today and see how youthful you can look. We’ve assisted guests from throughout the Greater Olney area, and we’re looking forward to serving you. We’re open Monday through Sunday, and our extended business hours make it easy to schedule an appointment. Contact Hand & Stone today to see what we can do for you.